The University of New Mexico’s innovationAcademy (iA) is going global. 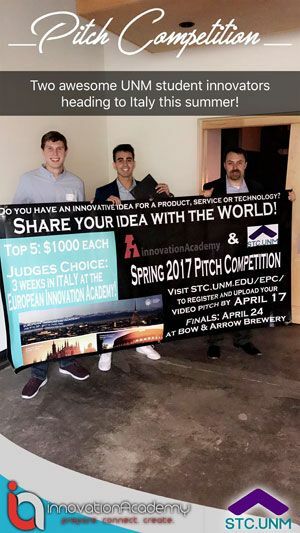 This summer, two iA students will spend several weeks in Italy participating in the European Innovation Academy (EIA) after winning the Spring 2017 iA & STC.UNM Pitch Competition held recently at Bow & Arrow Brewery. Munji Kahalah and Clayton Space won the competition, which featured 10 UNM student teams as part of the bi-annual event where student entrepreneurs pitched their business ideas for the chance to win $1,000. (l. to r.): Clayton Space and Munji Kahalah with Innovation Academy Director Rob DelCampo. Last semester, iA was contacted by the European Innovation Academy with the goal of collaborating and getting some students to participate in their summer program. Soon after, iA was the recipient of a generous gift from the New Mexico Gas Company (NMGCO) that made the iA/EIA collaboration possible. The EIA program is a three-week intensive where Kahalah and Space will be able to work alongside other students, mentors, and entrepreneurial experts from around the world. Rob DelCampo, executive director of the innovationAcademy, is excited that two of UNM’s most innovative students will represent iA in Italy this summer. If you would like more information, contact Tiffini Porter via email, tjp0217@unm.edu.